Two-ply fabric from Silver Tricot combined with black cotton. Attenuation 47 dB. Can be earthed. 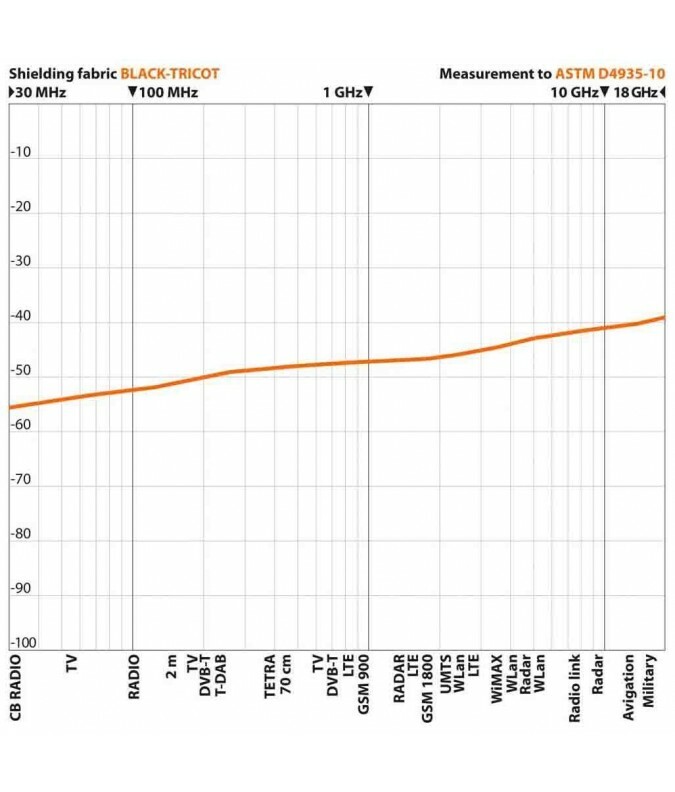 BLACK-TRICOT is a two-ply fabric from our Silver Tricot combined with black cotton for the protection against low frequency (LF) and high frequency radiation (HF). Typical application is for sewing textile products like articles of clothing, but also as curtains. For the sewing of clothes you may use the cottonside for the inside or outside of your garment. As the silver layer is reacting with sweat we would recommend to sew the silverside away from your body. Due to the heavy silvering the Silver-Tricot fabric side is loosing very little attenuation through washing and movement only. 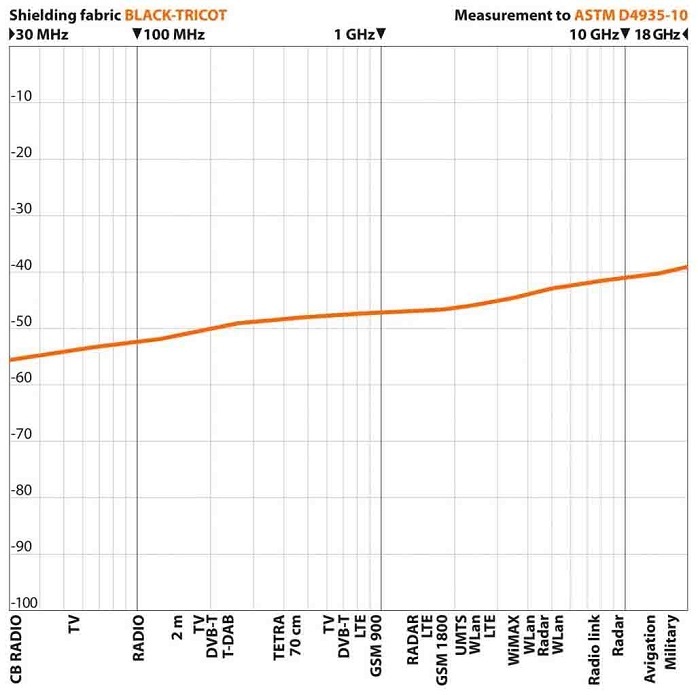 The silver side is certificated according to OEKO-TEX® 100, product class 1. Grounding: Electrically conductive. Can be contacted and grounded to shield electric fields (LF). We recommend a plug GP or GD, with a plate GM or GS, plus a cable GC. Fabric Care: Do not dryclean. Machine Wash Only at 30°. Use only Leblok washing powder. (Other detergents MAY have a severe effect on shielding level) Do not handwash. Do not tumble dry. Drip dry. Iron on LOW. Do not bleach. Application: Textile products, Clothing, Curtains etc. Please note: Silver products will discolor over time, however this is not a reason for rejection. Silver products, like any other fabric, have a limited lifetime; this depends on many factors, such as abrasion, frequency of use. Note: We do not use nano-silver.